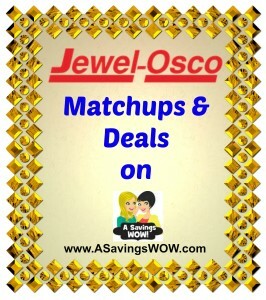 Jewel-Osco Matchups and Deals | A Savings WOW! When you buy 2 using $0.40/2 coupon. When you buy 2 using $1.00/2 coupon. When you buy 3 using $1.00/3 coupon plus get a free Gold Medal Flour, 5 lb. When you use $1.00/1 coupon. When you use $0.75/1 coupon. When you use $0.50/1 coupon and get a free Super Chill, 2 L when you buy one Orville Redenbacher’s Ready to Eat & Pop Crunch Popcorn, 5 – 6 oz. When you buy 4 participating products using two $2.00/2 coupons. When you use B1G1 coupon. When you use $2.00/1 coupon.